my hubby's favorite pizza is the hawaiian bbq chicken pizza. my hubby kinda stumbled across his love for that pizza, though. one day, my brother was over our house for a visit. we all decided to order some pizza and my brother wanted to order the hawaiian bbq chicken pizza. we looked at him like he was crazy. he swore it was amazing! so we decided to take his word for it and ordered one. he could not get me to try it. but my hubby, being the daredevil that he is, tried it. he almost passed out! from then on, it's been his favorite. i decided to use the 'hawaiian' theme on some chicken breasts i had thawed out, but i wanted to include asian ingredients. the sweet, salty and tangy flavors in this chicken had us dancing in our seats. in a mixing bowl, combine the soy sauce, brown sugar, can of pineapple tidbits (with the juice), lemon juice, ginger and garlic. whisk until brown sugar is dissolved. pour half of the marinade into a tupperware container. make sure all the pieces of pineapple go into that container with the marinade. cover with a lid and put in the refrigerator. pour the other half of the marinade into a large ziploc bag. add the chicken breasts into the ziploc bag as well. seal and allow the chicken to marinate for at least an hour, preferably overnight. combine the cornstarch and water in a small bowl. set aside. remove the reserved tupperware container with the marinade from the refrigerator. pour into a saucepan and allow to come to a bubble. once the sauce starts to boil, whisk the cornstarch mixture into the sauce. allow to thicken. remove from heat. set aside. while the sauce is heating, preheat a large oven proof skillet. i used a 14 inch cast iron. like this one here. add the oil. once hot, remove the chicken from the marinade, shake off excess and carefully lay into the skillet (discard the bag of marinade). allow to sear on that side for about 3 minutes, and flip. pour the reserved thickened sauce over the chicken breasts. immediately place the skillet in the oven and bake in the preheated oven for 15 - 20 minutes or until chicken is cooked through. shared on one creative mommy. shared on hun, what's for dinner? shared at thursday treasure's on food done light. i get carried away with the ginger and garlic sometimes, too. 🙂 i am so glad you enjoyed it, michelle! that is a great idea, theresa! it may taste even better with flavorful dark meat. please let me know how it turns out! I wish chicken breasts were that price here. 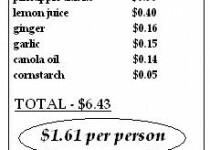 When I did groceries the other day, a package of 6 medium-sized chicken breasts was $20.00 — yes, I said $20.00. Needless to say, I opted for the chicken thighs instead. They were $16.00 for a package of 20 thighs. This is similar to the chicken teriyaki I make. I’ll have to try this recipe. 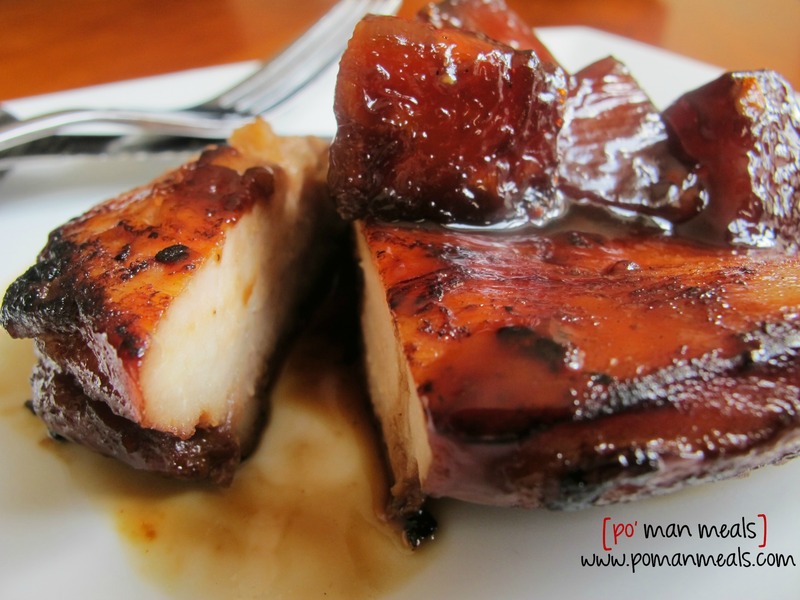 i LOVE teriyaki chicken… it has the perfect blend of sweet and savory. please let me know if you try it! I love that this recipe looks fabulous, and it’s gluten free! I’m pinning this, and I’m going to make it! Thanks for linking at OneCreativeMommy.com! Oh, I forgot to tell you, I’ll be featuring this recipe later today. Please come grab a featured button at OneCreativeMommy.com if you’d like! Ten minute prep time is pretty misleading when you have to marinate for an hour. i completely understand. i have updated the recipe. Just put my chicken in the fridge to marinate until tomorrow. Only thing I added to the marinade was a touch of red pepper flake (love red pepper flake with soy and pineapple). The marinade, before I put it on the chicken of course, tasted amazing. Delicious! My chicken breasts were monsters, though so I didn’t quite get a texture like what is pictured, but not the recipe, my chicken and I didn’t have a skillet large enough to halve them. Something to do next time, though. Thanks for the recipe! you’re welcome, tracy! those big chicken breasts always give us a run for our money! 🙂 maybe next time, after you brown the chicken breasts in batches, you can transfer them to a baking dish before putting it in the oven? thanks for letting me know how you liked the recipe. Goodness, this looks absolutely amazing! I’ve booked marked the recipe to try very soon! Thank you for linking up to Simple Supper Tuesday! Love the sweet, salty and tang from the ginger. I can just imagine how sticky & satisfying this chicken is. Thanks for sharing on Thursdays Treasures. Everytime I print a po’mans meals receipe, the INGREDIENTS LIST is not printed on it. Why? hi pat! i’m sorry to hear that you are having problems printing my recipes. i just printed the recipe and it printed out fine for me. are you using the green print button at the bottom of the recipe? Ohhhhh hells yes! This is looking AMAZING! Thanks for thinking of all our wallets! This looks delicious! I love the way the glaze gets kind of crusty on the chicken. This with some rice and green beans will be dinner soon. Thanks! Do you think I can try this chicken on a charcoal grill? 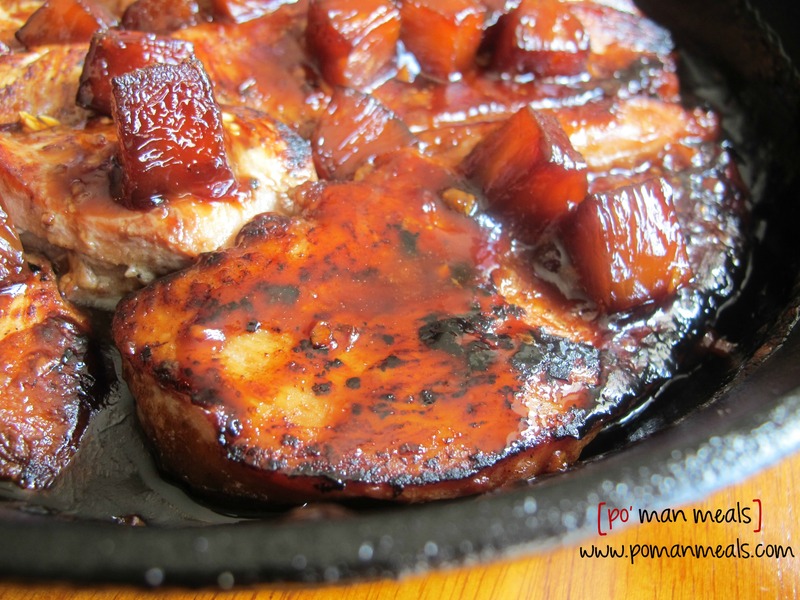 I’m not sure if the outside would burn because of the sugars in the marinade, but it’s worth a try. Maybe over indirect heat. I cooked this marinated chicken on the grill and served the sauce on the side as I wasn’t sure if everyone at my bbq liked pineapples. The grilled chicken breasts by themselves were very tasty and my sauce cooked up a little thicker than in your pic but was still very good. Everyone loved the sauce! Hi niece! I tried this one for dinner yesterday. It was finger lickin’ good and so easy. Uncle Jack said it was good and worth repeating! hi aunt lillie! i am so glad that you and uncle jack liked it. thank you so much for letting me know. please tell him i said, hi! i love you guys so much! This looks so good! Thanks for all the recipes you share! This recipe was a huge hit. I used a pinch of ground ginger instead of the grated and it tasted delicious. Thank you for all the great recipes you post on here!